Another week in the books and another fun set of posts on the site. This week, the guitar making series continues with carving the back braces. Then, I show you five free woodworking catalogs you can order, and a tutorial on texturing a ring. Enjoy. 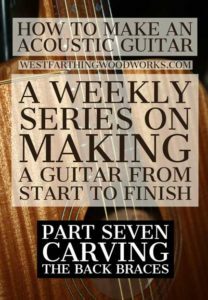 In How to Make an Acoustic Guitar Part Seven I show you my exact process for carving the back braces on your acoustic guitar. I also show several great tips and tricks that you can use along the way. Carving the back braces is pretty easy when compared to carving the top. The braces are fewer, they are about the same shape, and the profile is not as complex. The tips and tricks will help you get the most from your chisel, and make your back braces look really good. It’s not a difficult process, but you can really benefit from doing some things a certain way. From the sharpness of the chisel to the angle of attack, these little differences make a big difference. Who doesn’t love a free resource? I know I love free catalogs, and I have a healthy stack of them in a few places around the house for quick reading. 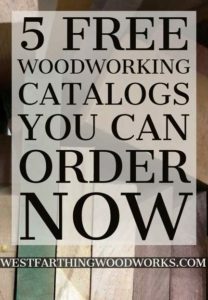 In 5 Free Woodworking Catalogs You Can Order Now I will show you exactly where to get the five catalogs that have come to my house regularly at one time or another. These are all great for beginners for a lot of reasons, but the main reasons are learning vocabulary, learning what different tools do, and coming up with new ideas. As you read through a catalog as a beginner, you get so much information, and that helps you develop your skills. Hop over to the post and order the catalogs. You will enjoy having them, and they will help you as a beginner. One of the easiest ways to add texture to one of your wooden rings is with a wire wheel, and the look is incredible. Since most rings are smooth, having textured offerings is a huge way to differentiate yourself form all the other ring makers in the world. 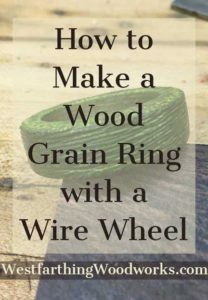 In How to Make a Wood Grain Ring with a Wire Wheel, I’ll show you everything you need to know in order to apply this amazing looking and feeling texture. Thankfully, the tool you need for this process is very inexpensive, and you can have it in your house in a couple days from Amazon. Learning to use the tool is easy too, and it’s so fun that you will really enjoy the learning process. If you have any questions about the post review for the week, please leave a comment and I will be glad to answer them. Happy building.